¡Mira! 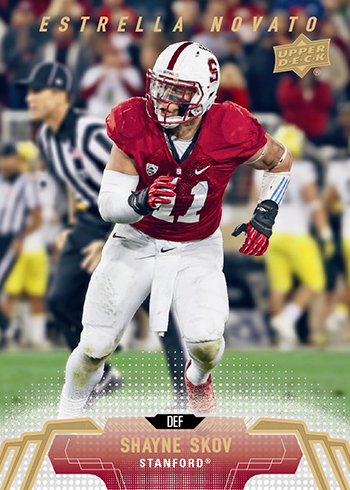 Shayne Skov’s 2014 Upper Deck Football Card will be in Spanish to Celebrate his Mexican Heritage! Brothers Patrick and Shayne Skov learned to player football in Guadalajara, Mexico of all places. They actually played with a local team called the Carneros (Rams) when they were growing up there before coming to the United States. Shayne ultimately attended Stanford and was able to have a memorable career with the Cardinal and now he spends his time preparing to enter the NFL Draft. And even though he spent most of his life in the United States, Mexico is still very important to him. In working with Shayne and his team, Upper Deck wanted to look to do something different with his “Star Rookie” card set to release in mid-April found in 2014 Upper Deck Football. No, he will not be featured as a “fútbol” player on the card as it is fútbol americano Skov has come to love. Instead Upper Deck has decided to print all the text on Skov’s rookie card in Spanish not only to celebrate his Mexican heritage, but to make a collectible available that will appeal to his Mexican fan base both here in the U.S.A. and in Mexico. American collectors will likely give the card a double take when they examine it fresh from a pack of 2014 Upper Deck Football, maybe even wondering if it is some type of error card. It is our hope that it will encourage them to go online and find out more about Shayne’s unique upbringing that will make him a dynamic athlete at the next level with all of Mexico behind him. 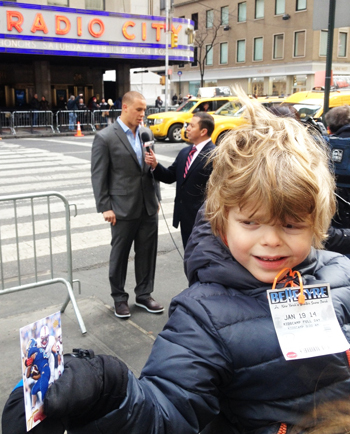 A young fan holds a mock up of Skov’s 2014 Upper Deck Rookie card as Shayne is interviewed by ESPN in the background. The 2018-19 Game Dated Moments Rookie of the Month – December Achievement is Now Live on Upper Deck e-Pack™! The 2018-19 Game Dated Moments Rookie of the Month – November Achievement is Now Live on Upper Deck e-Pack™! THE 2018-19 GAME DATED MOMENTS ROOKIE OF THE MONTH – OCTOBER ACHIEVEMENT IS NOW AVAILABLE! 2018-19 NHL® Game Dated Moments Week 2 Cards are Now Available on Upper Deck e-Pack™! How can we get ahold of one of those? Amazing! Jared, these cards will be randomly inserted into packs of new 2014 Upper Deck Football due out in the spring! I want a Shayne’s card ! Chris, when will we see the rest of the prelim checklist since we now know shayne is now card #99? The young fan is so attractive. Where did you find him? Is he a model or just someone from the street? He’s gorgeous !! Just found this card in a box set. I definitely thought it was an error.